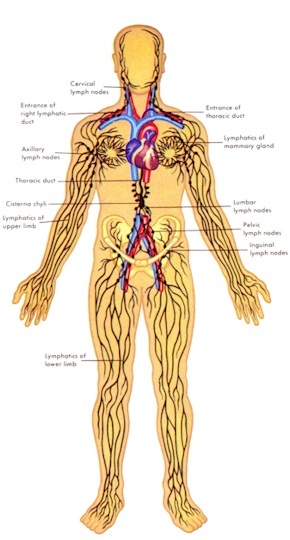 The Lymphatic System is a network of vessels that runs through your entire body. Lymph nodes are strategically located throughout the system for optimal performance, and are clustered in areas like the underarms, lower abdomen and neck. Be Aware!! Cancer loves an acidic environment. It can’t survive in an alkaline one. Your Immune System is the most important in the fight against this disease, so a healthy Lymphatic System is essential. But back to talking about your body’s amazing filtration system! In a nut shell, the bloodstream acts as the cell environment and ideally the lymphatic system prevents much debris from getting in the way and slowly drowning and poisoning the tissue. Once enough of the tissues become acidic then the vital organs gradually begin to lose their ability to maintain optimal blood, and this is just the environment in which cancer thrives. This is your body`s amazing filtration system! Aquarium enthusiasts know that without a filter to constantly renew the quality of the water for the fish, the fish would die swimming in their own acidic, toxic excrement. Now think about many trillions of cells packed tight and close together and every single one of them requiring groceries and waste management services. That presents quite a demand that only approximately 90,000 miles of blood capillaries and an estimated 180,000 to 300,000 miles of lymphatic vessels can fulfill! To our many trillions of cells this is the equivalent comparable to fishes in a fish tank with the most amazing filtration system conceivable. This is simple, basic “groceries and waste management services” for the cells. So how does our Lymphatic Fluid move? Mainly through our normal daily movements, and especially during exercise… the more vigorous, the better. Now, having said that, I have treated girls who were Physical Training Instructors in the services who displayed swollen Lymph Nodes and no one could be doing more exercise than them. So how come? This is my take on it. Imagine hosing out a drain. The water runs free for a time until a stick or something gets caught along the way. Soon, a bit of grass, maybe, gets hung up on the stick and before long a leaf or two does the same. As more and more builds up on the stick, we notice the water is backing up behind the debris and the drains effectiveness is compromised. This is what happens with your Lymphatic System. What happens when the Lymphatic System can’t function properly? How can you keep your Lymphatic System healthy? Drink plenty of water. The Lymphatic System depends on a constant supply of fluid, so it’s very important to drink at least eight glasses of water a day to keep it functioning at its best. Purified or filtered water is the best choice. Choose healthy foods. Preservatives, artificial sweeteners, refined grains, excess sugar, chemicals and processed foods all put strain on the Lymphatic System. Choose foods that are organic, whole and natural as much as possible. Get your essential fatty acids. Healthy fats are necessary for the proper function of the Lymphatic System. Good sources of essential fatty acids include pumpkin seeds, walnuts, almonds and avocados. One of the exercise methods recommended for improving Lymphatic function is rebounding… or bouncing gently on a small in-home trampoline (called a rebounder). 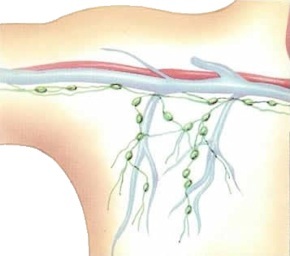 Since our Lymphatic Fluid circulates upward via a network of vessels, through one-way valves, this bouncing action helps push our Lymphatic Fluid up through these tubes and throughout our bodies. The more it circulates, the healthier it can keep us. Of course, we’ll also benefit from the cardiovascular workout, but the Lymphatic function is just as critical. Without proper circulation through the system and into our detoxifying organs, poisons just sit there. That’s why, when an older person breaks a hip and is bedridden, other problems often arise. It’s not the broken bone… it’s the inactivity that follows. Even the modest movements of independent living (walking, sitting down then standing up) are far superior to extended bed confinement. Do you need a Manual Lymphatic Drainage? A Manual Lymphatic Drainage is especially supportive of the Lymphatic System and removes the toxins that have accumulated in your body making you lethargic and run down. 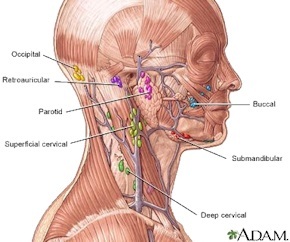 (A general Swedish or Remedial massage will reveal the extent your Lymph Nodes are swollen). However… be sure to wear loose fitting underwear because you don’t need anything acting as a tourniquet and restricting fluid movement. If you’ve already had a Lymphatic Drainage, you’ll know how good you feel afterwards. Sometimes there can be side effects, but this is relevant to the amounts of toxins that were removed from your body and how it is performed.